Canadian carrier Bell is getting the exclusive to offer the Sony Xperia Z in the country. The phone will be available in black, white and purple and you can now pre-register for the device. All that means is that you give Bell your email address to receive notifications as to when the phone will be available for pre-order. Judging from the looks of things, Bell is going to be pushing the waterproof aspect of the device. The Sony Xperia Z has won 13 awards since being announced in January. 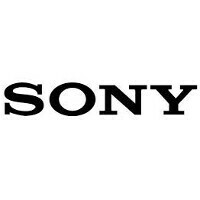 The clever set-up used by Sony at CES to promote the waterproofing of the device and the reception that the phone received at the show, might have given Samsung the impetus to offer a waterproof version of its flagship model, the Samsung Galaxy S4 Active. 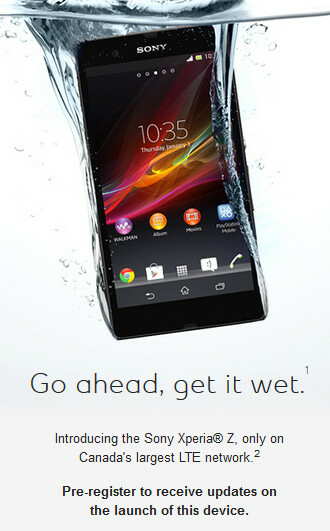 The Sony Xperia Z will be available at Sony and Bell stores in Canada starting later this month. Just in case you've forgotten the specs, let's go through them one more time. The device will feature a 5 inch screen with a resolution of 1080 x 1920 (FHD). That works out to a pixel density of 443ppi. Under the hood is a quad-core 1.5GHz Qualcomm Snapdragon S4 Pro processor with the Adreno 320 GPU handling the graphics. 2GB of RAM is onboard and the 16GB of native storage can be expanded using the 32GB capacity microSD slot. The 13.1MP rear-facing camera captures video in 1080 x 1920, while the front-facing camera comes in at 2.2MP. A 2330mAh battery powers the phone and Android 4.2.2 runs the show. With IP certification of 57, the phone can withstand submersion in 1 meter of water for up to 30 minutes. My guess is nothing. They usually offer Roger's exclusivity for free and Roger's didn't even want it. The only other phone Roger's passed on was the Xperia Ray. My guess is that Roger's just said no thanks and Bell is the only one that wants it. Unlike the USA and Asia, in Canada it is, literally, just Apple and Samsung. And maybe Blackberry. At least it's running the latest OS (something they haven't always been the best at), also a great screen as long as you are looking at it head on. Always love Sony phone design and UI ( reminds me of the style that LG uses).